She wears a pair of belted braies, a collared shirt, and a pair of sandals. Her only other possession is a small amount of gold. 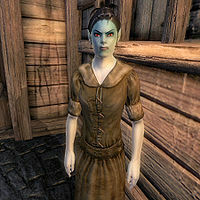 Like the other citizens of Aleswell, Adosi is affected by a high-level Chameleon spell called "Ancotar's Invisibility."